New issue of Sina Book is different in three sides from the previous issues. First, Sina Book is credited as an academic magazine from the Ministry of Higher Education. Thus, it is noticeable to congratulate this academic achievement and success to academic faculties and colleagues and to appreciate the day and night efforts of all those brilliant people who were involved in this success. Crediting the Sina Book as an academic magazine is the sign of high academic capacity in this university and this, in a wider vision, will be a cause of more encouragement for scholars and educational colleagues in the country. The second characteristic which separates this issue of Sina Book from the previous ones is its concentration on experience of Muslims’ democracy especially in the West. Nowadays, most of the Islam World is caught in violence and excessiveness. From Middle East to Northern Africa, all are caught in a kind of violence and problem in political legitimation. A part of this problem is because of the power based governments which are governing most of the Islamic societies. Thus, noticing the democracy issue in Islamic societies can at least be a burrow in this issue. In the article: why the door of Arab World hasn’t been opened to democracy?, from Larry Diamond, the author mostly concentrates on the roles of political and cultural relations among Arab World in reproduction of authoritarian in these societies. In two articles: After Arab spring, collusion of Islamists in Tunisia; and Passage in Tunisia and mutual allowing, they talk about successful experience of democracy in one of the most important Arabian countries. The article: renewal of authoritarianism, agitated arbitraries of Saudi Arabia; is important because it reveals a bright picture of political and social situation of this important Arabian country. The article: Islamic parties and democracy; can be an appropriate maneuver for knowing the democracy in Arab World. In this article, the author talks about key role of Muslim Brothers (Ekhwanul Muslimin) in formation of our understanding from the relationship between democracy and Islam. The third characteristic of this Sina Book is the publishing of English articles from professors of friendly county Kazakhstan. A part of an academic magazine’s credit goes back to cooperation and publishing of article from other universities. 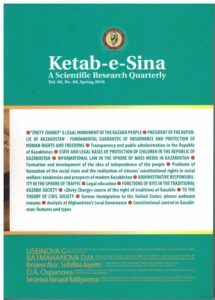 The collection of articles in the English part includes experience of Kazakhstan Country in good governance, civic society, and civil structure, which were authored by some of the outstanding Kazakh professors and some of the Afghan master students in Kazakhstan. The collection of the above mentioned articles can include valuable lessons and points for Afghanistan. Articles related to Kazakhstan Country can be proper tunnel in order to expand and to amplify Afghanistan’s view to area of countries in Middle Asia. 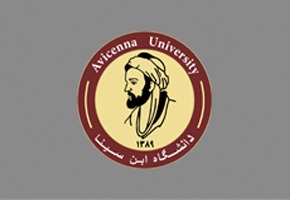 Finally, the article: Rights of crime victims in Afghanistan and international documents, authored by Dr. Ghulam Haidar Allama has stated new discussions in the area of sufferer and victims’ rights, which is unique and intact in its kind and has increased the richness of this present Sina Book.